Here is a satellite image from January 7, to give you an idea of current snow conditions. It's a big image--Panamints are about 2/3 of the way to the right and near the top. Snow and clouds are blue. New images generally appear mid afternoon Pacific time. Snow doesn't look terribly deep, but looks like it is pretty much everywhere above 8000 ft. I am enjoying reading all your posts on hiking this peak. I yet to do it and I have been coming back to DV at least yearly since 2010 after being away for 32 years. I'll be back again this late March but I won't be hiking it then. I'll need to condition more and will do the hike this end of October trip. perfect weather generally then. Thanks, JesPortland. If you ever get a chance in March, it is totally worth it to hike just the first 1 mile (according to caltopo, but I think it is slightly over 1 mile) and back. That is where you come around a ridge and first see the mountain from the trail. A spectacular view, especially when there is snow. First, as I've been told (have not been up there myself with a lot of snow) the issue with the trail route to the summit is a cornice at the top. A cornice is a snow cliff overhang, often with a bit of hollow at the bottom. This is very difficult to ascend (and if you stand on top, it may break off, dropping you down to possible injury). An ice axe isn't going to be of much use in that situation. You'd probably be better with crampons or cheaper/lighter instep crampons or yak trax, in case the snow is crusty from repeated freeze/thaw, making it a bit slippery. When crossing a steep snow field of course an ice axe is preferred, though you better at least look at some videos about self arrest, and don't forget to wear the wrist band. Second, as far as the road, understand that the NPS is rather conservative on its road ratings. I've gone up the road to the end in a sedan a couple of times with no problem. I'm not saying it could be done today, even without snow and ice. There are a couple of sections that are a bit steep and could be icy, and these would get you, though less likely with 4WD. Higher clearance is always nice, and prevents a bit of white knuckle driving. A lot depends on your skill, preparation for dealing with getting stuck, and perseverance. You might post the question just before you go and see if you can get any first hand comments. First, as I've been told (have not been up there myself with a lot of snow) the issue with the trail route to the summit is a cornice at the top. A cornice is a snow cliff overhang, often with a bit of hollow at the bottom. This is very difficult to ascend (and if you stand on top, it may break off, dropping you down to possible injury). An ice axe isn't going to be of much use in that situation. You'd probably be better with crampons or cheaper/lighter instep crampons or yak trax, in case the snow is crusty from repeated freeze/thaw, making it a bit slippery. Good point on the cornice. When I came back up after descending into the upper canyon in April 2017 (at about 9950 ft), it was difficult (and a little scary) getting up and over the cornice. I chose a spot where there was a tree just below it to break my fall in case I started to slide back down. I have not had a chance to really practice using an ice axe for self arrest, so was nice to have that bit of insurance. I forgot that I was actually up on the trail twice in 2015....April 11, and April 22. You can see some difference in the amount of snow between those dates during that dry year. I take a lot of pix too, and it's sometimes really useful to go back and refer to them for conditions and route planning some other time in the future. That shot is from about 7400 ft on the way up the main Hanaupah Canyon ridge. I must have looked like a crazy person coming back up to the Badwater parking lot carrying an ice axe. Yes, the pix are extremely useful for new plans, and for remembering what happened and when. I frequently look at the time stamps to get an idea of how long it took to do things, and use that to estimate how long something similar will take. Just yesterday, I figured out I had been wrong about something. I had thought that you never see the actual peak of Telescope until you reach 11,000 ft, because it is blocked by the false summits. But then, I was looking at a shot I took from the peak and noticed that the peak should be visible from a short section of trail. So, I went back to one of my other shots from the trail and zoomed far in, and, sure enough, you get just a barely-noticeable glimpse of it, for maybe 0.1 miles of the trail. I can only see it on zoomed in shots. I added couple more pics illustrating this. Needless to say, next time I am there, I am going to pay closer attention to the peak from that spot. I really want to hike to Telescope Peak when there isn't crazy deep snow up there. 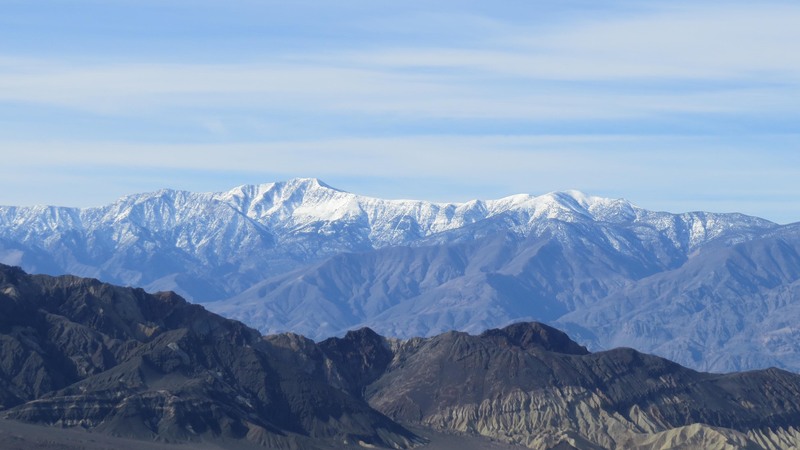 Here's a photo I snapped this morning 1/19/2019 from Navel Spring across the Borax Benchmark to Telescope and Rogers Peaks. You'll have to determine yourself how much snow you can handle. I believe it rained in the park this week as there is still standing water at DV Junction (saw that driving in last night) and in the slot canyon, I explored above Navel Spring today. Hope this helps. To comment on my previous post, about the road from Thorndike to Mahogany... I was reading in the current issue of the Sage (Sierra Club DPS group) of a trip in November 2018 where there were some significant issues about getting 2WD drive cars up the road so... as always.. conditions vary. Always have a Plan B!